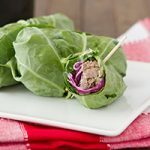 Low-carb wraps filled with keto-friendly fillings – coleslaw, sprouts, and meat. Wrapped in a collard leaf. A perfect packable lunch, especially when paired with a glass of Genuine Health vegan greens+O. Today’s recipe is perfect for at home, or on the go. 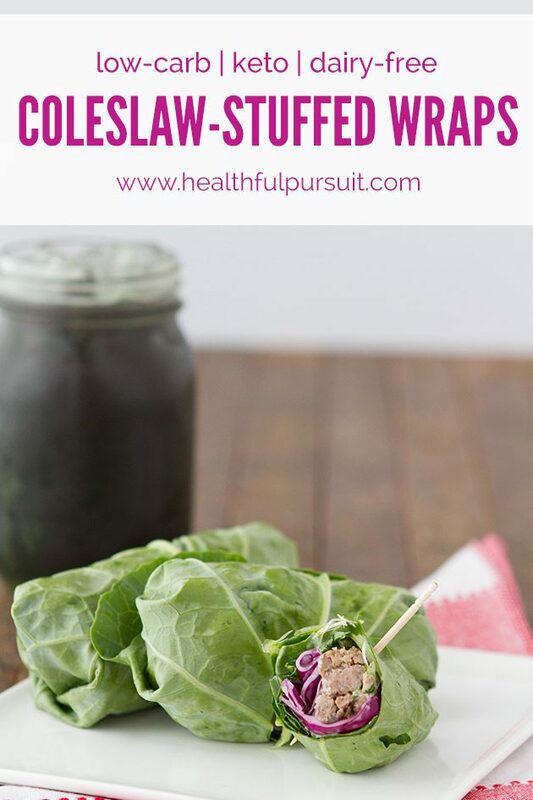 If you’ve ever tried wrapping your favorite sandwich fillings in a collard wrap, you know how delicious it is, and how well collards work as a substitute for grain-filled wraps. And if you haven’t tried this yet, you must! 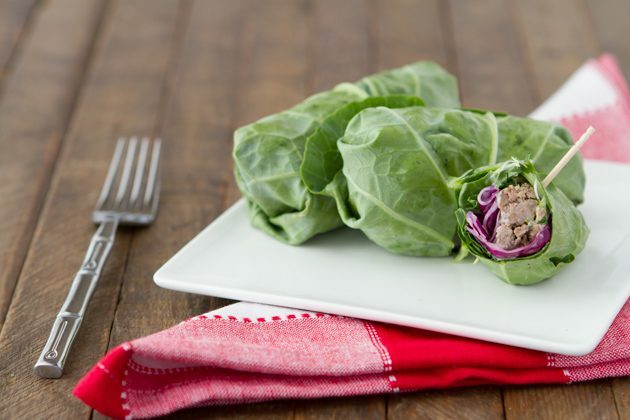 Collard wraps are a wonderful way to pack more nutrients into your day. Perfect for boosting your intake of greens. And, if you want to go the next step with your intake of greens, you could pair these wraps with a serving of Genuine Health vegan greens+ O. It’s a greens powder for those who are both passionate and sensitive about the foods they eat. The O is for organic – with the inclusion of organic ingredients, greens+ O is also vegan, wheat-free, gluten-free, soy-free, and dairy-free. And, if you’re taking these wraps with you on the go, vegan greens+O comes in one-use packets so you can take your greens powder with you, and add it to water wherever you are. This lunch-friendly keto recipe is perfect for back to school, no matter what the age. I always have a container of cooked ground meat in the fridge ready for recipes like this. The great thing about this recipe is that you can use just about any leftover meat you have kicking around. Heck, even lunch meat would do the trick! If using lunch meat, aim for 2 slices of meat per wrap, so 32 slices in total. 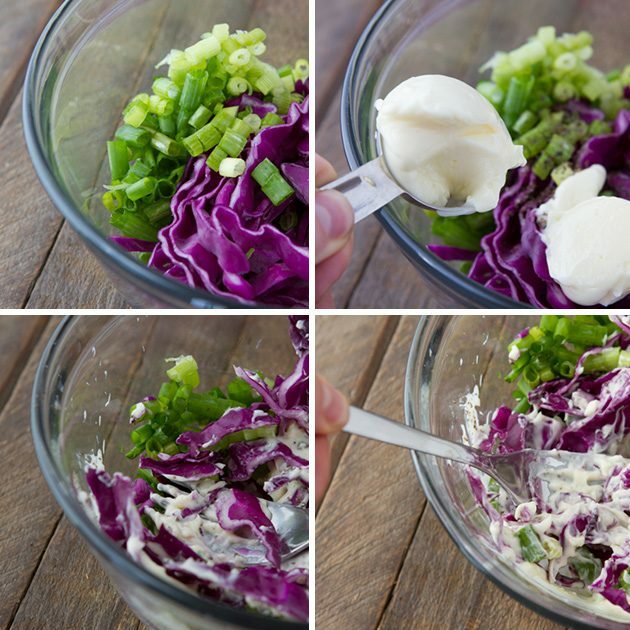 Combine coleslaw ingredients in a large bowl. Mix with a spoon, until everything is coated well. After removing the stem, each collard leaf should have a strip missing from one edge to about midway through the leaf. View images below for detailed instructions. 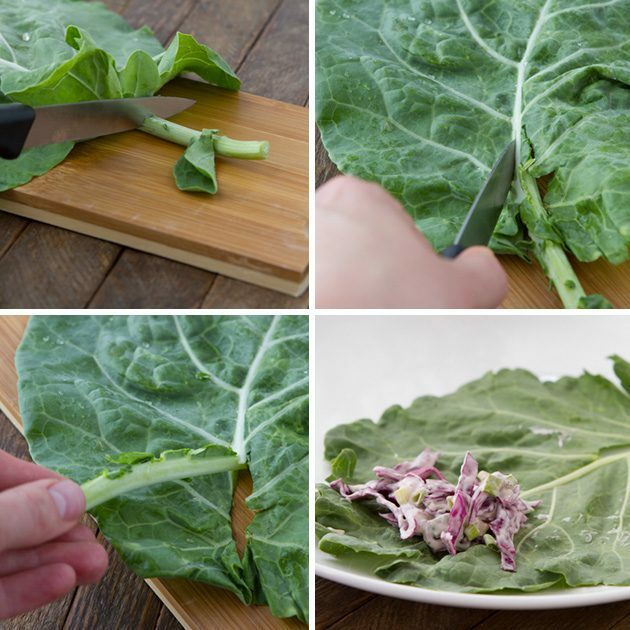 Place the first collard leaf on a clean surface. Place a spoonful of the coleslaw on the far edge of the leaf, where the stem has not been cut. Then, add a spoonful of meat, and top it with sprouts. Begin rolling, tucking in the sides to avoid filling from spilling out. View images below for detailed instructions. Once the wrap is rolled, insert 1 to 2 toothpicks on an angle, into the wrap, to hold it together for transport. This can be especially helpful if packing in your lunch. Divide wraps into 4 servings, 4 wraps per serving, and enjoy! For potential leftovers, store in an airtight container in the fridge for up to 3 days. 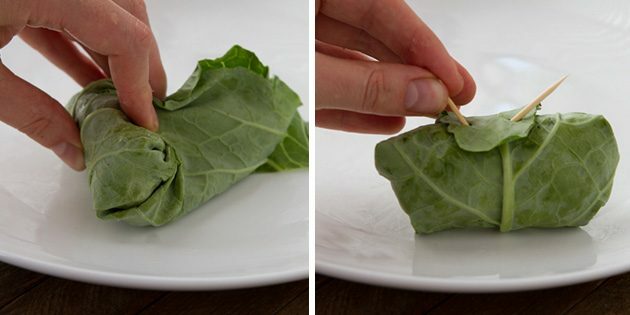 If you’ve never made a collard wrap before, the following images will help you make sense of how everything gets rolled up. The key is not to go hog wild with the filling. Otherwise, the rolling will result in filling going everywhere. If you’re traveling with your wraps, be sure to add toothpicks! I’m always excited to share a recipe with you that provides you with tools to boost your intake of greens. I know for myself, it’s almost too easy to go a whole day without eating much in the way of vegetables and get to the end of the day wondering WHY I waited until 5 pm to have something green. I find with keto because I’m not always hungry (which is an awesome thing!) I forget to eat for hours and hours. 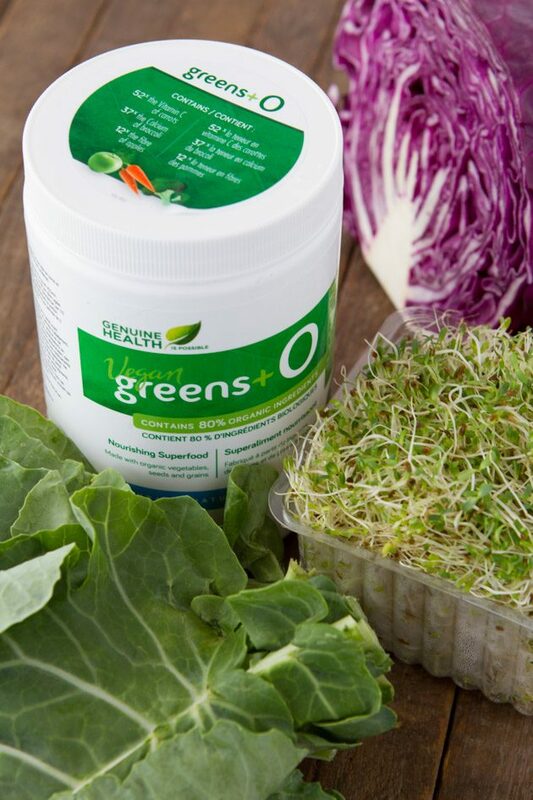 This is where a greens powder like Genuine Health vegan greens+ O fits in so wonderfully. My morning practice consists of drinking it every morning, so whether I eat first thing, or not, I know I’ll have a bunch of greens in my body regardless. 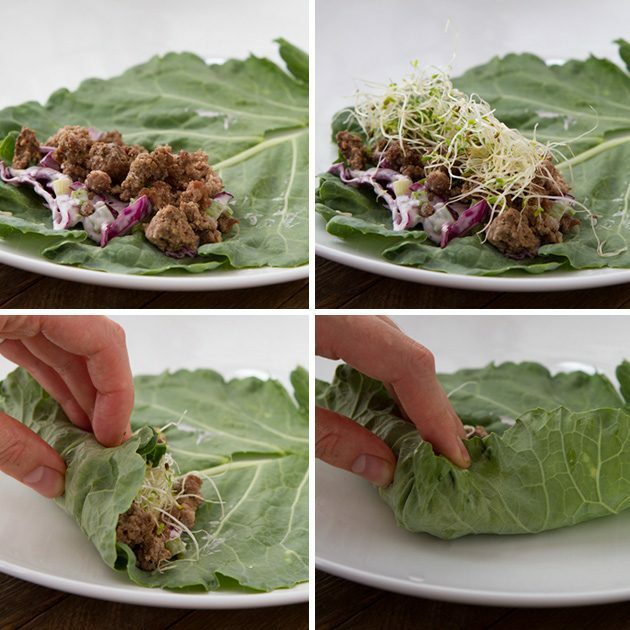 What fillings are you going to place in your collard wraps? Let’s chat about it in the comments below.